This article by Calibrate Legal’s Gordon Braun-Woodbury was published in the July/August 2018 issue the the LMA’s magazine, Strategies. 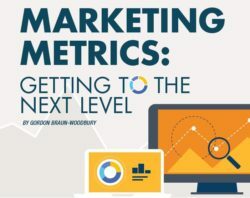 For law firm marketers today, creating marketing metrics has become relatively simple. But building credible, relevant metrics remains a significant challenge. With the shift to digital marketing channels, almost anything is measurable. Every marketing activity, every contact, campaign, and interaction leaves its own breadcrumb trail that can be analyzed and reported. CRM, Marketing Automation and Social Media systems now collect a virtual flood of marketing data. Sophisticated analytical and dashboarding tools are available – often free of change — to any marketer who is prepared to invest time in learning them. Faced with such an array of measurement choices, many marketers adopt a broad activity-based approach to measurement – for example, counting visitors, clicks, likes, email opens. These metrics are generally easy to obtain, and they can generate insights for benchmarking the department’s channels and improving overall efficiency. But they don’t address the central marketing measurement problem – how to demonstrate that Marketing/BD is fulfilling its purpose of contributing to the firm’s revenue growth. In other words, Marketing Return on Investment (ROI).